You know you want to somehow work in the medical field but you really have no desire to go to school for an extended period of time. At least, not at the moment. Did you know that dental assisting was ranked as one of the Best Health Career Support Jobs by USNews.com? Learn more about how to become a dental assistant so you can enjoy a career in the medical field. Find a dental assisting school near you. In some states, dental assistants are allowed to to perform procedures such as fluoride application, sealants, and topical anesthetics. When choosing to become a dental assistant, you are choosing to head toward a stable, enjoyable job. It doesn’t take long to get the necessary education, so you’ll quickly join the workforce. There are two different routes available: Trade or vocational school takes approximately 9 months to 1 year to complete. You will graduate with a diploma or certificate. Community college in the other option. It takes two years to get an associate degree. The benefit of getting an associate degree instead of a diploma or certificate is that, if in the future you choose to go back to school and become a dental hygienist, you already have those credits to transfer toward your bachelor’s degree. Most states require dental assistants to be certified, so there is a certification exam you’ll be required to sit for once you’ve completed your schooling. To be eligible to sit for the certification exam, you must have graduated or received your diploma from an accredited program. CODA, or the Commission on Dental Accreditation, has accredited nearly 300 programs nationwide since 2015. It should not be too difficult to find an accredited program. Is A Dental Assistant Career The Right Choice For Me? If you’re considering a career as a dental assistant, then you may be wondering if you have what it takes. Are you making the right choice? It’s normal to second guess yourself, especially in the wake of a big decision like picking a career. There are certain qualities you should possess if you are thinking about becoming a dental assistant. Even if these characteristics don’t sound like you, that doesn’t mean you shouldn’t consider becoming a dental assistant. You aren’t going to be judged if you don’t embody every single bullet point listed. Even if you can relate to only one or two of the key qualities, don’t be discouraged! You are compassionate and empathetic. You are intelligent and you "get" things. You always try to do the right thing. You are patient and personable, and people like you. You believe in being part of a team. You can meet and surpass goals, both professionally and personally. You pay attention to detail. To become a certified dental assistant, you’ll need to sit for, and pass, an Certified Dental Assistant (CDA) exam which is given by the Dental Assistant National Board (DANB). Passing this proves to your potential employer that you are proficient and knowledgeable in the ways of dental assisting. However, it is not a required step; you are able to work as a dental assistant without certifications. You would just make more money as a certified dental assistant. To be eligible to sit for the CDA, you first must go through and pass an accredited dental assistant program. If the program you attended is not accredited, or you were trained on the job, you will be ineligible to take this exam until you completed two years of work as a dental assistant and are able to provide proof. Each state has different regulations, and some offer other certificate and licenses in addition to the national one. Check with your state to find out their requirements. When choosing a Dental Assistant program, first and foremost you should make sure the school is accredited with American Dental Association’s (ADA) Commission on Dental Accreditation (CODA). The program’s completion time, prerequisites, and curriculum. If you want to get it done quickly, and only focus on dental assistant curriculum, then a certificate route is for you. But if you want more options opened and are fine with spending two years in school, then perhaps consider getting an associate degree. Consider the school location. Is it convenient to your residence? Factor in inclement weather conditions and long drives. The closer to your home, the more likely you are to get to school every day. Is the school affordable? If not, what type of financial aid is available? Does the school offer internships or externships to help students gain real-world dental assistant experience? What is the graduation success rate of the school you’re thinking about attending? What is the student-to-teacher ratio? Smaller class sizes equal better academic success for many. Does the school prepare you well enough to pass the certification exam. Is there a program in place to help graduating students obtain jobs post-graduation? During your time in dental assisting class, you’ll be exposed to subjects such as oral anatomy, radiography, and clinical dental assisting. You may also learn administrative skills, how to take x-rays, the process of recording medical histories, how to use all the tools of the dental trade, and chairside manners. Accredited programs will not only include coursework but also supervised practical, hands-on learning. Every program has a variation on a common curriculum theme due to certain criteria that is expected from accredited schools. You can learn more about your potential program's requirements by calling the school admissions office. Not all states require you to have a diploma to be a dental assistant (some areas allow on-the-job training). However, it’s becoming a more competitive field, so prospective employers are now leaning toward hiring those who went through an accredited dental assistant program. Orientation to Dental Assisting: You’ll learn the history of dentistry and touch on all the basics of dental assisting. Chairside Etiquette: You learn how to treat patients and perform dental procedures. There may be more than one course in the curriculum. Dental Sciences: There will have a couple different sections you’ll take separately. You’ll study the microorganisms and diseases of the mouth, as well as treatment. Dental Materials: You'll learn how to use all the tools of the trade. This course may be broken up into several different sections that you’ll take separately. Basics of Oral Radiology and Clinical Oral Radiology: These are two different courses that you will be taking. Basics is the class you will learn about the history and effects of radiation, how to protect yourself while taking x-rays, and how to use the different types of machines. Clinical is where you’ll apply that knowledge. Office Management: You'll learn the skills necessary to run a dental office. Everything from front desk to administration work will be learned in this type of course. Computer Applications: You'll be given instruction on using the business systems in dental offices. Scheduling, records, accounts receivable, and more will be taught. There are quite a few factors that go into the cost of dental assistant schools including private school versus public, diploma versus certificate, in-state school versus out of state. Some schools include books and supplies. At others, those are additional and potentially significant costs. Generically speaking, dental assistant programs cost between $1,000-$30,000. Chattanooga College has a dental assistant program that costs around $15,000 before any financial aid packages kick in. And Keystone Technical Institute's 10-month dental assistant program runs around $35,000. Diploma and certificate programs, because they don’t take as long as an associate degree program, will cost significantly less. Enrolling in a public school within your home state will greatly reduce the cost, as well. Out-of-state tuition is much higher than in-state resident pricing. Be sure to check with the financial aid department of the school you plan on attending, they can help you find scholarships, loans, and grants. Make sure to read this article about financial aid or check our complete financial aid guide to learn more about the process. Expanded Function Dental Assistant: This is the highest level of dental assistant positions. EFDAs are usually licensed by their state, allowing them to do fillings and sealants. You must be a certified dental assistant with two years of full time dental assistant employment to be eligible. EFDAs can earn up to $26/hour, but this depends on the location and industry. Dental assistant instructor: You would be educating students in the same manner you received your instruction. You would be teaching courses such as radiology, how to use the dental tools, how to interact with patients, keeping dental records, and hands-on instruction. Dental assistant experience is required if you want to be a dental assistant Instructor. The median salary for a dental assistant instructor is $38K. Dental office business team administrator: In this role, you schedule appointments and maintain the office financing and record keeping. You also take care of insurance on the patient level, as well as filing insurance claims. Business team administrators are usually the first faces patients see when they walk in the office. You need to know how to build relationships with patients to keep them coming back. While the business team administrator doesn’t necessarily need to be a dental assistant, dentists usually prefer the experience. Dental office business team administrators earn between $33,000-$61,000 depending on level of experience and other determining factors. Dental sales representative: You'll need to be familiar with sales techniques. You should also know dental terminology and types of equipment that are used in a dental office setting and understand the needs of dental offices. Dental sales reps make sure the dental offices that are in their territory have their supplies and technology to keep them up to date. You'll work very closely with the office staff and the dentist to determine what their needs are. The median annual salary for a dental sales rep is $45,000. However, you could earn well over $75,000 per year, depending on what company you work for and your experience. Dental hygienist: If you are pursuing a career as a dental hygienist, becoming a dental assistant is a great start. It’s a hands-on educational experience unlike any other. Many who start as assistants move on to become hygienists; this is a natural career progression. Licensing and training for both positions are slightly different. A dental assistant receives experience working directly with patients. Part of the training for this career also includes various safety procedures and logistics of the home dental office. The median annual salary for a full-time dental hygienist is $72,910. Dental consultant: When a dental practice is having issues thriving, they call in a dental consultant. The dental consultant will work alongside the dentist and office staff to make recommendations on how to get the practice back in working order. The dental consultant will also train the dentist and staff on the new best practices for the office. A good dental consultant needs to be familiar with dentist offices and their procedures; you need to know dental terminology; you should understand the dynamics of the office you are working with; and you should be an excellent communicator. Median salary for dental consultants is $46,000. The high end is $100,000 yearly. Dentist: It is not all that uncommon for a dental assistant to continue on through an educational path to become a dentist. Dentists will diagnose, treat, and provide oral care to patients. Dentists earn a median annual salary of $159,770. Dental assistants are critical to the functionality of dental practices. By becoming a dental assistant, you are opening up a broad career ladder for yourself. Also, as a dental assistant, you are an important part of a team. And it only takes a maximum of two years to get there. Usually, dental assistant positions are full time. 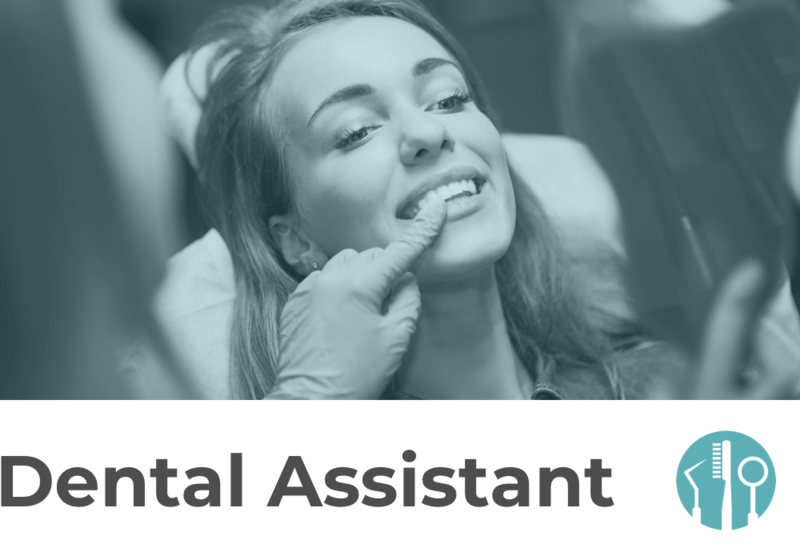 The median annual salary for dental assistants is $38K. The lowest 10 percent, generally entry-level dental assistants, earn $26K annually. Dental assistants who have more experience earn $53K. Certified dental assistants earn significantly more than those who haven’t obtained their certification. Most dental assistants work full time and may have to work some evenings and weekends. Pay for dental assistants may look different in every state and within the employed industry. For example, dental assistants who work on a college campus earn slightly less than those employed with a dental office. And dental assistants who work in hospitals or with the government earn higher salaries than the national average for dental assisting. Geographic location will also have an influence over dental assistant salaries. Metropolitan areas pay higher salaries than non-Metropolitan areas. Our aging population, combined with more access to insurance, is driving the job outlook for dental assistants up 19 percent between now and 2026. The average employment outlook for most other careers is around 5 percent, so dental assistant careers are growing much faster than the national average. Through 2026, there should be close to 64,600 new jobs opening for dental assistants. This should make finding a position fairly easy for those who are qualified. Dentists will be looking to hire more employees, including dental assistants, as their offices become busier with people who, with better insurance, are taking care of their oral health.